As I’m giving the playtest Classes chapter a once-over before sending it out to the playtesters, I’m thinking about the problem of “choice paralysis” in gaming. Choice paralysis is when you have so many options for what your character can do on your turn that you have a hard time decision about which you should use on your turn. That slows down the game. The opposite problem is choice scarcity: when your character has so few options that none of them seem appropriate or effective for the current situation, so you’re forced to make a weak choice because you have no other options. This is especially common at low levels, where your character only has a couple of special abilities. And double especially so for 3E prepared casters like clerics and wizards, where the number of unique spells you can prepare each day is far smaller than the number of them you actually know… so each day you’re hoping to prepare the right abilities you’ll need that day, and hope that you don’t need the one you didn’t prepare. I wanted 1st-level characters to have enough special abilities (cronks, spells, or stunts) that they’d have a good chance of having something useful to do on their turn. But I didn’t want them to have so many that they’d have difficulty deciding. Related to this is how many special abilities you can prepare each day, which is now 5 for 1st-level characters (because I like that 5 pops up a lot in the game). Up until earlier this week, most characters had 2 special abilities at 1st level, but I just increased that to 4. Two at 1st level, like how a 3E fighter has one feat for being a 1st-level character and one combat feat for being a 1st-level fighter. Two more from your class specialization. For example, if you’re a ranger who chooses the archer specialization, you learn Deadly Aim and Far Shot. (Depending on your class and specialization, you might have two offensive, an offensive and a defensive, a defensive and a miscellaneous, and so on). That lets a well-rounded 1st-level character have a fun offensive special ability, a fun defensive special ability, a fun miscellaneous special ability, and one more choice that doubles up on one of those categories. Four special abilities at 1st-level shouldn’t be so much that it causes choice paralysis, and not so limited that you have choice scarcity (because 4 is less than you 1st-level limit of prepared abilities per day, you’re always able to prepare all four of your specials). As you gain levels, you’ll be learning more abilities, but the number you can prepare each day also increases to keep pace with that. So a 10th-level character has about 15 “slots” they can prepare, and about 13 special abilities they know, so they can always choose to prepare all of their abilities. If 15 “slots” sounds like a lot to select each day, keep in mind that a 10th-level character is the equivalent of a 5th-level 3E character, and a typical human wizard5 can prepare 10 spells per day (plus more from having a high Int) and knows 6 feats, for a total of 16+ options. And if so many choices is intimidating, remember that some of your daily choices could be math-free options like “I can wear heavy armor” or “I can craft potions” … or they might be things that you always keep “on,” like 3E’s Iron Will. Anyway, the main point of this blog post is to say that most 1st-level characters will get 4 special abilities and have enough “slots” to prepare all of them each day. Or 5, if you’re a bard, because bards are all about having extra choices. You don’t have to build a well-rounded character. For example, you could pick four offensive combat abilities if you want, but that probably limits how useful your character is outside of combat. That’s just counting the special abilities from leveling. 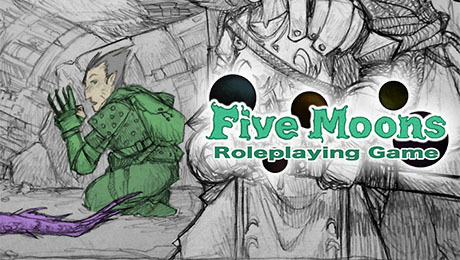 Because in Five Moons RPG you can keep learning other abilities if you spend the time to do so, a studious sort of character might know quite a few more, but I’m looking at the baseline. I like the sound of what you’re trying to do. I had wondered if ‘overchannelling’ could help alleviate that see-saw balance of finite or overwhelming resources: allowing PCs, particularly low level ones, to keep using abilities/spells that may have already been used up, but at a cost? Thanks for sharing your design thoughts. Looking forward to seeing how well slots work. I have to admit, particularly with all of the third party supplements for Pathfinder, that the number of choices for any given character borders on the insane. Yet they provide a great amount of customization for players looking for a particular build. That said, the number of choices that prepared spellcasters have when choosing their spells for the day is even more insane. I like the way you are trying to balance out the way their abilities work, however, would that not hurt the versatility of wizards, for instance? Part of what I like about the class is the fact that they have limitless possibilities, despite their need to guess at what spells they need to prepare. Isn’t part of magic item creation, for instance, part of the creative application of arcane magic? Looking over the logistics of class features compared to Pathfinder, that actually does seem about right. Though, the Pre-Alpha had spells with multiple general uses, which was something I liked but recognize it does add more to this. What about your race? Doesn’t that give you some abilities at 1st level? Choice paralysis was a problem that always made me wonder why people recommend 4th Edition as good for beginners. My group got into tabletop RPGs with 4th Edition. I was the guy that read the rule book and tried to help others figure out the game as I did. But they all struggled because a 1st level character can start off with over 10 powers, some of them having long paragraph descriptions. Most just memorized one or two powers and used them exclusively, even months into the campaign. And making characters took longer than 3rd Edition. And we played our game online with power cards, spreadsheet character sheets, and D&D Insider’s tools.